• Sheepadoodle dog breeders are listed below alphabetically by state / city. • Click on underlined words to see their Sheepadoodle. 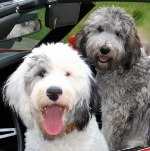 •Please tell the Sheepadoodle breeders with puppies for sale that you found them on BreedersClub.net. The Sheepadoodle is the result of cross breeding a Standard Poodle male dog with an Old English Sheepdog female. The result is this hybrid breed (mixed breed or designer breed). Because it hasn't been standardized, this designer breed doesn't have an agreed upon name, thus one may find it listed as some variant of the parent dog breed names. The Poodle breed lends low-shedding and low-dander characteristics. Other characteristics attricutable to the Poodle is the high intelligence factor. Some herding instinct may be passed on through the Old English Sheepdog genes. This breed directory page features Sheepadoodle dog breeders with puppies and/or adult dogs for sale. Once you purchase your new found friend, you will want to provide it the best in pet health care. Be sure to visit our online discount pet supplies catalog and order NuVet Plus™ to keep your puppy and adult dogs in top condition. The discount catalog also features collars, leashes, carriers, general pet care products and much more. Sheepadoodle dog breeders, you may place an ad for your puppies and/or adult dogs for sale and stud service on BreedersClub.net to find qualified buyers.